represents a distribution with ν degrees of freedom. For integer ν, the distribution with ν degrees of freedom gives the distribution of sums of squares of ν values independently sampled from a normal distribution. ChiSquareDistribution allows ν to be any positive real number. ChiSquareDistribution[ν] represents a statistical distribution parametrized by a positive value ν indicating the degrees of freedom of the distribution. ν determines the general shape of the probability density function (PDF) of a chi-square distribution, and, depending on the values of ν, the PDF may be either monotonic decreasing or may have a single "peak" (i.e. a global maximum) with a potential singularity approaching the lower boundary of its domain. ChiSquareDistribution is the distribution followed by the square of a chi-distributed random variable. In other words, if is a random variable and (where denotes "is distributed as"), then . The sum of a collection , , …, of identically normally distributed independent random variables is also chi-square distributed. 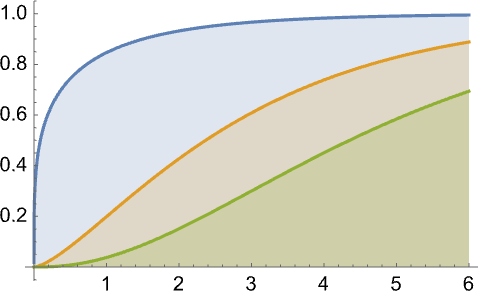 The chi-square distribution can be used to quantify the goodness of fit between a theoretical or empirical model and a collection of samples. Specific applications include magnetic resonance imaging and the analysis of possible associations between disease exposure and transmission. RandomVariate can be used to give one or more machine- or arbitrary-precision (the latter via the WorkingPrecision option) pseudorandom variates from a chi-square distribution. Distributed[x,ChiSquareDistribution[ν]], written more concisely as xChiSquareDistribution[ν], can be used to assert that a random variable x is distributed according to a chi-square distribution. Such an assertion can then be used in functions such as Probability, NProbability, Expectation, and NExpectation. The probability density and cumulative distribution functions for chi-square distributions may be given using PDF[ChiSquareDistribution[ν],x] and CDF[ChiSquareDistribution[ν],x]. The mean, median, variance, raw moments, and central moments may be computed using Mean, Median, Variance, Moment, and CentralMoment, respectively. DistributionFitTest can be used to test if a given dataset is consistent with a chi-square distribution, EstimatedDistribution to estimate a chi-square parametric distribution from given data, and FindDistributionParameters to fit data to a chi-square distribution. ProbabilityPlot can be used to generate a plot of the CDF of given data against the CDF of a symbolic chi-square distribution and QuantilePlot to generate a plot of the quantiles of given data against the quantiles of a symbolic chi-square distribution. TransformedDistribution can be used to represent a transformed chi-square distribution, CensoredDistribution to represent the distribution of values censored between upper and lower values, and TruncatedDistribution to represent the distribution of values truncated between upper and lower values. CopulaDistribution can be used to build higher-dimensional distributions that contain a chi-square distribution, and ProductDistribution can be used to compute a joint distribution with independent component distributions involving chi-square distributions. 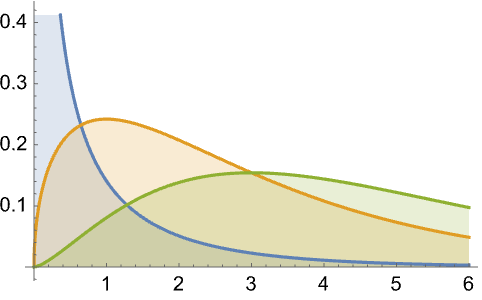 ChiSquareDistribution is closely related to a number of other distributions. For example, several distributions, including GammaDistribution, ExponentialDistribution, InverseChiSquareDistribution, UniformDistribution, and LaplaceDistribution, can be obtained by transformations of ChiSquareDistribution, while NormalDistribution and FRatioDistribution are limiting values for transformed versions of ChiSquareDistribution. Moreover, ChiSquareDistribution can be viewed as a special case of a number of other more general distributions, including RayleighDistribution, MaxwellDistribution, PearsonDistribution, and ParetoDistribution. ChiSquareDistribution is also closely related to BetaDistribution, StudentTDistribution, UniformDistribution, and NoncentralChiSquareDistribution.